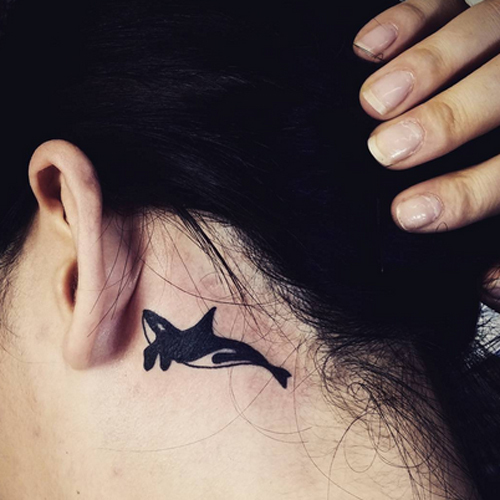 What about the Dolphin Tattoos? The dolphin has always enjoyed a reputation as the friend of the seaman. Nautical folklore abounds with stories of them playing alongside sailing ships or frolicking with humans who were swimming in the ocean. There are even tales of them helping to save shipwrecked sailors who were in danger of drowning, or of them taking on sharks head-to-head in order to save their human friends from a terrible fate. Because of these and other stories, the dolphin is seen as a good luck talisman, a bearer of good tidings, a friend. If you look at pictures of them, their faces seem to smile benevolently back at you. Because of their playful, fun-loving personalities, they symbolize a free-spirited enjoyment of life, the sea, and the natural world. Aside from being amusing natural clowns, humans have always sensed this animal’s innate intelligence, which some scientists and observers have speculated could rival human intelligence. So if you think about it, the attraction of getting a depiction of one on your body is easy to understand. We humans have always identified with the strongest, most beautiful, most graceful, most intelligent animals and the dolphin embodies all these qualities and more. It’s no wonder that so many modern citizens of every country in the world have adopted it as their own personal animal totem. When you identify with this creature, you are proclaiming your allegiance with one of the most wondrous creatures, an animal that is beloved by adults and children alike. 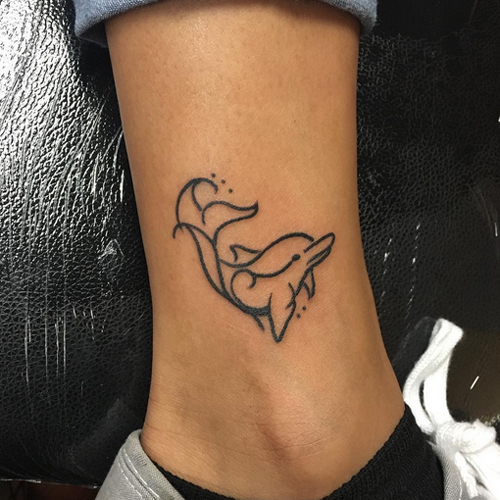 It’s no wonder that dolphin tattoos of every size and shape are among the most popular designs right now. Just as there are many different species of animals out there in the natural world, there are also a wide variety of designs that represent many of the world’s views of these creatures. If you look through any artist’s book of samples, you’ll find dolphins of every shape, size, and style. They are popular as ankle tattoos, lower back tattoos, on the back of the shoulder, bursting from the surface just above the shoulder blade, on the inside of the forearm, or just about anywhere else an artist can imagine. Each culture that has access to the world’s seas has its own unique vision of the animal. There are Celtic interpretations, tribal interpretations, and the more future-minded wearer may get a sleek futuristic dolphin tattoos on his body in a style that emphasizes the animal’s streamlined shape with shiny metallic textures and gleaming highlights. The great thing about them is that they’re adaptable to almost every artistic style and form of personal expression.